When Al D. Hyde and the Key Tones take the stage, their audience absorbs the musical energy, leaving them in an excited state. 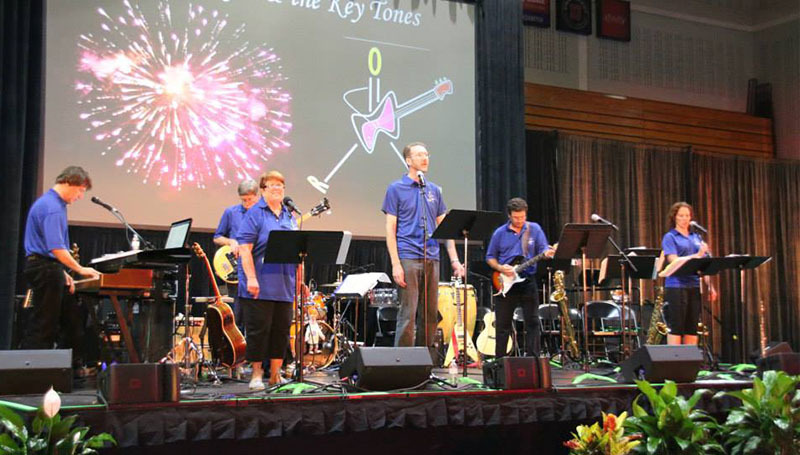 This year’s gig at the 25th Biennial Conference on Chemical Education at the University of Notre Dame in South Bend, Ind., was no different, says Dr. Michael Garoutte, a professor of chemistry at Missouri Southern and a member of the band. This year, Garoutte – who returns from sabbatical this fall – took lead vocals on three songs during the concert held in the student center ballroom overlooking the football stadium. The group – which takes its name from the organic compounds aldehyde and ketones – started out covering Motown and ‘80s hits. The setlist has evolved since then, though their formula remains the same. The biennial conference is one of the best available for chemistry educators, especially at the college level, he says. This year’s event drew nearly 1,600 attendees from around the country and abroad. The performance by Al D. Hyde and the Keytones is always a highlight.